I love berries. I think they have to be my favorite fruit. Raspberries (red and black) and blueberries are my absolute favorites. 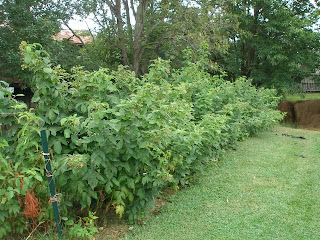 Our first spring here, we accepted the gracious gift of raspberry canes from a couple at church who were thinning their patch. 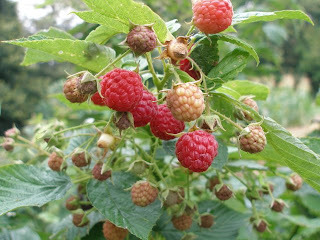 That first summer, we were able to pick a few and since then, have been enjoying them immensely. This variety is called 'Heritage' and bears twice a summer- early (June) and late (late August/September). Each spring, we chop them off to about knee height and have been occasionally digging up new shoots to plant additional rows. Sadie is my berry girl. 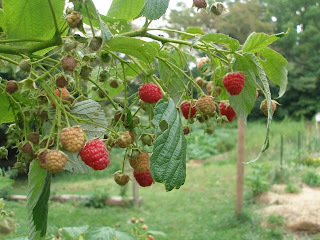 From the time she could walk, she could be found at (or in) the raspberry patch. To this day, she doesn't really care about their state of ripeness. If she can reach them, she'll eat them. We eat them on our oatmeal, on homemade ice cream, in muffins and cobblers. The rest I freeze for a winter's day and for Sadie's birthday cakes. They are always adorned with her favorite fruit. Our main patch, between bearing this summer. My Aunt Valerie told me yesterday that she loves your blog. "She's always up to something," she said. My mom tried to leave you a comment (but couldn't because your post doesn't allow for anonymous comments) to tell you that she likes your blog. Very sweet. I just adjusted my settings. Now, anyone can comment:-). I found you through Clover Lane this morning and I have to say that your blog is just delightful. My husband grew up with a huge garden in their backyard. We've had one for a while put I never truly appreciated it until we removed it to put in a swingset last summer. I can't wait to find a good spot and start it up again. I am so inspired by everything you've done here and can't wait to show this to my husband too. Thanks for taking the time to blog your activities and recipes!